This is going to get real deep ... and likely change the future of D1 basketball. This isn't a patty-cake NCAA investigation. There's going to be some people going 'up state'. When Pitino and his AD are suspended, that does seem like a distinct possibility. It's "up the river", which started when New York City criminals were sent to places like Sing Sing up Hudson River. "Up state" is a Pennsylvania saying for Philadelphia convicts being sent to live in the hills. I don't know what it is called in Kentucky, but since this may be a Federal crime, it would be "going to club fed" for these nonviolent types. I wonder what the future holds for Arizona coach and Pitt alum Sean Miller after one of his assistants got busted? Maybe Pitt can get him to coach them if he can be sent to a federal institution in western PA and secure furloughs for game days. College athletics has been replete with corruption forever now. Remember when Reggie Bush got busted and forfeited his Heisman and everyone running shocked about it. Please! Just about every guy who won the Heisman or didn't win it did the same exact thing as him. It was really stupid and silly to single him out. Like he was the only one. Next time you watch the Heisman presentation and see all the past winners standing on stage----just know that very likely ALL OF THEM were absolutely no better than Bush. I see Andy Enfield's USC program was mentioned in this. Kind of sad that no one at Pitt was ambitious enough to try and be corrupt or secure a bunch of hos for recruits. LOL. I can't wait until this eventually spills over to college football and some of these programs get busted for the same stuff. I'm sick and tired of these false narratives that the same schools get the best players simply because of the size of their stadium or their tradition. That doesn't work all the time. You listening Bama, Ohio State, Penn State? If it's happening in basketball ... it's DEFINITELY happening in football. That's where the big money lives. Basketball is peanuts compared to that world. This basketball thing is just getting started. This is going to get deep. 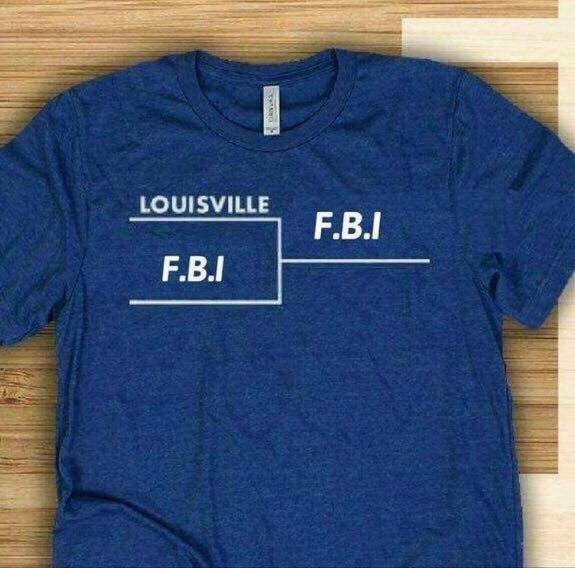 Unlike the pathetic NCAA investigations, the FBI has full subpoena power. NCAA investigations get taken with a grain of salt ... do they really want to punish the big schools who bring in the most dollars ... i.e. letting PSU off so easy when the death sentence should have been given? The FBI could care less. You know it's bad when that scum pond Louisville finally decides to ditch Slimy Pitino. Yeah, few things nauseate me more than hearing Penn State fans gush about how their football program has "risen from the ashes" of those "devastating " sanctions. The program should've been shut down for a minimum of 2 years. What they got doesn't even constitute a slap on the wrist. It seems kind of silly that the FBI is involved in this to be honest. Or maybe that just tells you how very corrupt things are for the highest magnitude of law enforcement to be involved. No surprise there. This is happening across the board, not just a few rogue programs. That was my point with the Reggie Bush example. Maybe Pitt could hire Pitino. Slimey yes, but at least he knows how to win. I'd take the new experience and be okay with it at least for awhile. I wonder if Sean Miller will survive out in the desert? If not, maybe Pitt can get him! These first four assistants who got arrested aren't going down quietly. They'll squeal like pigs for plea bargains. I'd say Miller is in big shizzy. Well, hopefully Pitt can land a good coach once the prison terms are completed. If there is significant, provable criminal conduct involved, does the FBI limit their investigation to the few high profile programs that have been named so far, or go where the evidence leads ? Listening to sports talk the other day about the MELO trade to OKC, I was reminded that BILLY DONOVAN is now the coach there. BD played for RP a long time ago and his NC teams @ FLORIDA had a lot in common with LOUISVILLE. He only left college ball 2-3 years ago, so statute of limitations is not an issue. Does anyone think this has potential to spread beyond college sports ? I would have to say that it definitely has the potential to spread like a wildfire with the FBI involved. I personally feel that this stuff is pretty much a non-story to be honest. It's like pulling over three cars for speeding when there were a hundred or more all going the same speed. It's a pretty arbitrary thing. As NCAA rules exist--- the whole landscape of big-time collegiate athletics is polluted. What I would personally love to see is the FBI or some powerful entity investigate the New England Cheatriots. The crap they have pulled over the years would certainly rival the infamous 1919 Black Sox scandal. The NFL merely swept it all under the rug much the way the higher-ups in Happy Valley did with the Sandusky scandal. I hope D1 basketball is cleaned up after this and we do not end up paying college athletes. The NCAA is not perfect. The 3 divisions make sense but it is very unfair when it comes to marketing and exposure. The only reason an athlete goes to any D1 school is to get more exposure, especially when it come to basketball. I wish schedules were computer generated this would make everyone pretty much on the same level.